Will Trump opt for a Beltway newcomer to lead EPA, or an agency insider like former air chief Jeff Holmstead? Photo courtesy of Chairman Ed Markey via Flickr. As President-elect Donald Trump's team considers its options for U.S. EPA administrator, it's weighing the advantages of picking an agency expert versus a Beltway outsider, according to sources close to the transition. Trump has already met with several prospects for EPA chief, including Oklahoma Attorney General Scott Pruitt and former Texas regulator Kathleen Hartnett White. 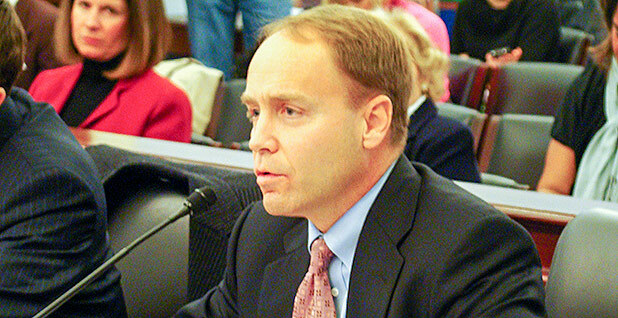 But former George W. Bush administration EPA official Jeff Holmstead and his allies are also making a push for him to get the job, sources say. Several less-known candidates are also still under consideration, including Donald van der Vaart, secretary of the North Carolina Department of Environmental Quality. Carol Comer, commissioner of the Indiana Department of Environmental Management under Gov. Mike Pence, the vice president-elect, is another name that's still circulating, said one source close to the transition. West Virginia Republican Attorney General Patrick Morrisey had been in the mix but made it clear he wasn't interested in the job, that source said. As Trump considers his selection for the prominent job, those close to him are weighing whether someone like Holmstead — who is intimately familiar with the agency — or an outsider with state expertise would be a better pick for accomplishing the administration's goals of drastically reshaping the agency. Trump previously said he'd like to abolish EPA entirely. Although he has since walked back from those comments, he and his allies have made it clear they plan to slash Obama administration programs and refocus the agency, which has long been loathed by many industries. "Some people are weighing in at the highest levels saying you need a guy like Jeff Holmstead because he's a guy who knows the agency inside and out," said the source close to the transition. Others, the source said, are arguing that "he's too institutionally tied to the place" and "you need somebody coming in completely fresh from the outside." Among the advisers said to have Trump's ear on energy issues are oil tycoon Harold Hamm; billionaire investor Carl Icahn, who is interested in renewable fuels policies; and Robert Murray, CEO of Murray Energy Corp.
Icahn is one of a number of people who are "intrigued" by Holmstead's candidacy, said an energy lobbyist familiar with the transition. Holmstead hasn't yet been scheduled to meet with Trump and Pence at Trump Tower, but "he's definitely on the list," that person said. The other source close to the transition said Holmstead has "some pretty powerful people reaching out on his behalf." Pruitt and Hartnett White are both Beltway outsiders, which could boost their profiles in Trump's eyes. He has picked some former Bush administration officials for his Cabinet — including his Transportation Department selection, Elaine Chao — but EPA is one agency where some energy insiders predict Trump will want to send a strong message that big changes are on the way. Pruitt has gained fame in the energy world for helping to lead the legal fight against the Obama administration's signature climate rule. Hartnett White is a Texas regulatory expert who has called for restraining "the imperial EPA." Trump's roster for his EPA transition team offers an early indication that he intends to take a new approach at the agency. The names announced so far for the EPA transition team include prominent climate change skeptic Myron Ebell of the Competitive Enterprise Institute and Amy Oliver Cooke, a former talk show host who works at a Colorado free-market think tank and has advocated "irritating the extreme eco-left." David Schnare, general counsel at the conservative Energy & Environment Legal Institute and a well-known critic of the Obama administration's environmental regulations, has been advising Ebell, according to the source close to the transition. Schnare has not been officially named to the transition team. He was previously an attorney in EPA's enforcement office. Trump could be announcing his roster of top environmental and energy officials in the coming days. He said Friday that "almost all" of his Cabinet picks would be named this week. Two Democratic senators — Heidi Heitkamp of North Dakota and Joe Manchin of West Virginia — "are both being seriously considered" to head the Energy Department, said the source close to the transition. Heitkamp met with Trump last week in New York. North Dakota Republican Rep. Kevin Cramer is also scheduled to meet with Trump today, and Hamm has said he has urged Trump to pick Cramer for DOE secretary (see related story).